#1 (cropped), May 24, 2018. (http://www.modern-senior.com). Augusta Uwamanzu-Nna, Harold Ekeh, Micheal Brown, Elmont Memorial High School, and Mirabeau B. Lamar High School must be very proud of themselves these days. And they all should be. After all, Ms. Uwamanzu-Nna joined Mr. Ekeh as being the only two students in the history of this high school to gain acceptance to all eight Ivy League universities — in back-to-back years, in 2015 and 2016. Mr. Brown was four-for-four in his quest for Ivy League admissions at Harvard, Yale, Princeton, and the University of Pennsylvania in 2017-18, and went 20-for-20 in college admissions overall. Uwamanza-Nna and Ekeh each went 13 for 13 in their applications to colleges ranging from Johns Hopkins and New York University to Harvard, Yale, and Princeton. They are among a very short list of above-the-rim, high-achieving high school students who have the distinction of winning the college entrance lottery. They have credentials (and with full rides, the means) to attend any and every elite institution in the US. That’s just it, though. In so many ways, this narrative of American education as one of “winners and losers” merely reinforces a society of haves and have-nots narcissistically competing for limited and segregated resources. With a closer look at Uwamanzu-Nna’s, Ekeh’s, and Brown’s backgrounds, it becomes obvious that despite their amazing achievements, their success was predestined. Both Uwamanzu-Nna and Ekeh’s families are from Nigeria, and both moved to the US when they were of elementary school age. Uwamanzu-Nna’s father remained a physical therapist after moving to the US, while Ekeh’s parents “left comfortable lives in Nigeria” to take jobs at a Target store in Queens to provide opportunities for their five children. Both families picked places within the Sewanhaka Central High School District to live. The district is made up of a group of Long Island bedroom suburban towns within Nassau County, including Elmont. 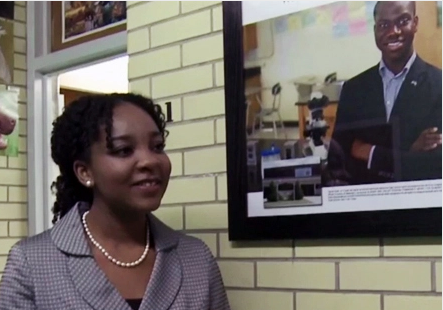 Augusta Uwamanzu-Nna standing next to a picture of 2015 graduate, Harold Ekeh (cropped), Elmont Memorial High School, Elmont, NY, April 5, 2016. (CBS2). This decision for the two Nigerian families could not have occurred by accident. The Sewanhaka Central High School District and especially Elmont Memorial High School has long had a reputation of providing an atmosphere of academic excellence and being a welcoming environment to students from immigrant families. Uwamanzu-Nna and Ekeh both benefited from such an environment and from families willing to sacrifice in order to push their children to win the academic lottery. 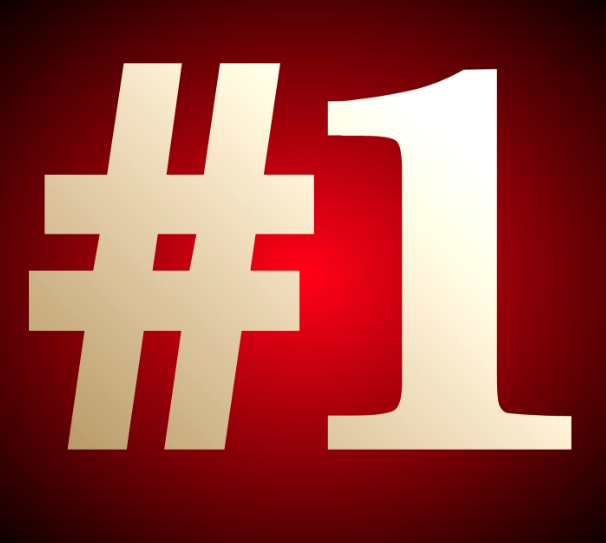 In the US, getting into any Ivy League institution — much less all eight — is the pinnacle of being #1. Brown’s case is a little less obvious in terms of advantages. But clearly Brown’s mother’s continuous efforts to enrich her life and her son’s life academically and socially were critical to his high-flying success. “When I was in elementary school, I saw my mom graduate from community college and that just meant a lot to me,” Brown said to USA Today last month. Involvement in extracurricular activities in school and year-round after school programs like “QuestBridge, Emerge Fellowship and Breakthrough Collaborative,” where Brown got to mingle with students of color with college aspirations, must’ve helped with both his academic motivations and preparations. This more than made up for whatever deficiencies Brown faced in his education because of growing up in the Third Ward in Houston (where several of my uncles and cousins on my mother’s side lived between the mid-1970s and the early ’00s). There are a couple of ways to look at Uwamanzu-Nna’s, Ekeh’s, and Brown’s success. One is to take the route of racist jealousy. “It’s a little obnoxious because you can only go to one, you can only take one full ride, and you are taking a spot from someone else who worked really hard,” co-anchor Holly Morris said on her FOX5 DC morning show. There was a huge backlash in response. The response implied that Brown’s achievement was a sign of showboating, that Brown was merely an attention-seeker. Keep in mind, the media sought Brown out, not the other way around. Keep in mind, Americans obsess over obvious measures of success. But somehow, if you’re Black, you can’t be joyful and in the moment over such success, even when the press is shining a floodlight on you. 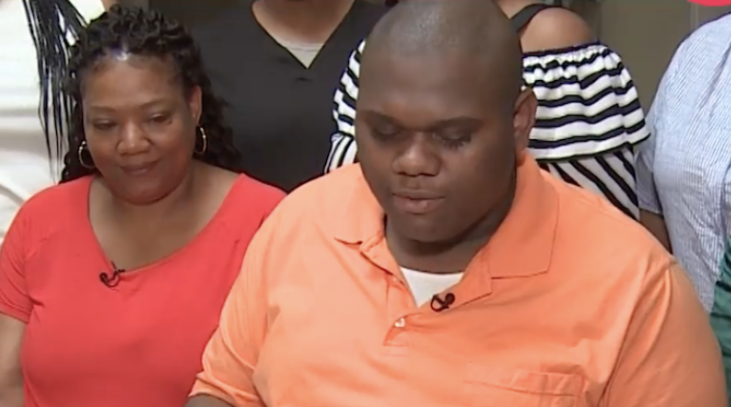 Micheal Brown and his mother Berthinia Rutledge-Brown sharing the news of him getting into all 20 schools to which he applied, Houston, TX, March 31, 2018. (https://www.rawstory.com/). Another way to look at Uwamanzu-Nna’s, Ekeh’s, and Brown’s achievements, though, would be to see their stories as a positive for them as individuals, but a negative for our society as a whole. With the increased emphasis on standardized curricula, standardized testing, and standardized individual teacher evaluations based on this testing has come an obsessive focus on the individual in education. The savior teacher as superhuman, somehow able to make every student into a proficient test-taker. The grinding student, ready to score a proficient or higher score on every school district, state-level, and national standardized test. The tiger mom-esque parent, willing at a moment’s notice to spend money that most Americans do not have to tutor and drill their child into excellent test scores. All involved in education for the greater good, but more and more, for their greater good. All without knowing about what their children have really learned, whether their students can really work in unison on a common goal, or if their kids can create, innovate, or think independently of a test-taking script. I’m sure that Uwamanzu-Nna, Ekeh, and Brown’s have learned a lot in their respective journeys to Harvard, Yale, and Stanford. But what does this measure of achievement mean for them down the line? Is it merely their ability to meet the right people and find job opportunities looking for them around every corner as a result of their academic achievements? Or do their achievements mean anything beyond the material, for them and for the rest of us? The “winners and losers” narrative also plays itself out in insidious ways for parents at the have-nots end of the scale. Because America’s educational resources are unevenly segregated by race and social class across its 14,000 school districts, the opportunities for winning this competition are also segregated. School district boundary hopping has become more prevalent in recent years. This as the competition for better-resourced schools has become more intense, all in the wake of the Great Recession and the resulting reduction in education budgets. 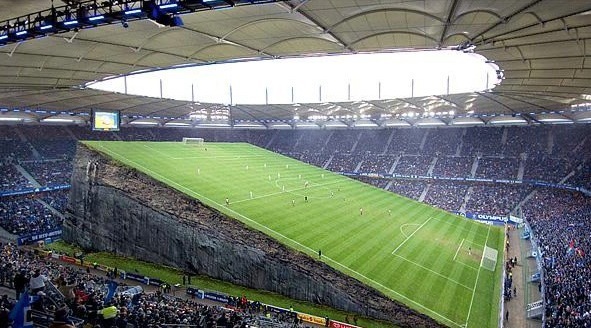 Unlevel playing field (soccer in this case), August 5, 2013. (http://funatico.com). One famous case of boundary hopping occurred in 2011. Kelley Williams-Bolar, an African American, Akron, Ohio-area mother, was arrested for and convicted of falsifying records to enable her two daughters to attend a more affluent school district in the area for two years. (Williams-Bolar’s now deceased father Edward L. Williams was a legal resident of the Copley Township district at the time.) The real crime here is that a patchwork public education system based on income and place of residence exists at all. That it also promotes an obsession with competition and mostly pre-selects students to be #1 in the line for the elite university is worse still. That is why Uwamanzu-Nna’s, Ekeh’s, and Brown’s achievements look so remarkable. They won an educational game that in so many ways our society had rigged for them to lose. Augusta Uwamanzu-Nna, Harold Ekeh, and Micheal Brown are among a truly lucky handful. Their parents found a welcoming home in a diverse suburban community with well-resourced (if somewhat segregated) schools, or enriched their child with resources not available to most kids in poorer and segregated urban school districts. They won the competition for #1. For most Americans, though, the education game is rigged, as the system reproduces and reinforces residential, racial, income, and academic inequality. Not to mention, the American idea that there should be winners, losers, and a grinding competition to show who won and lost. One of the more haunting songs for me from the ’80s is Phil Collins’ “Another Day In Paradise.” It came out in the mid-fall of 1989, and ended the ’80s as a #1 hit. It was also #1 to start the ’90s. For those who were younger than ten in late ’89, “Another Day In Paradise” was a song about chronic homelessness and the callousness of folk toward the homeless, in the UK and in the US. There were at least three million people living on the streets between Battery Park in New York and the Santa Monica Pier in Southern California when Collins released his admonishment for the world and God to do something about what was then considered a serious crisis. It’s not Phil Collins’ best song. But if you gave a damn about people you saw every day, leather-faced, wearing tatters, obviously sick in body and broken in mind, then this song may have touched you in some way. It touched me. Just sixteen months removed from five days of worry about my future, sleeping on a concrete slab, and washing up in public bathrooms, I was going to be moved by “Another Day In Paradise” anyway. Unlike most Americans, I cannot walk by someone homeless and not have it register that this could be me. I don’t give change every time a panhandler asks me. I’m not made of money. Sometimes, though, I do tear up, because seeing families without a place or home sitting on a sidewalk in the rain should make anyone sad or angry. Especially on days like today, when much of the nation is around 10ºF (-11 or -12ºC). America had as many as five million homeless people during the height of the Great Recession, and as few as about 600,000 as recently as a year or two ago. But as with most social statistics, this is likely an underestimate. There are plenty of well-washed, well-kempt, and somewhat healthy folk in this country who don’t have a place of permanent residence. They bounce from friend to friend or from extended family member to caring loved one. They may have access to a bed or some halfway house or temporary housing. Still, they aren’t guaranteed a place to sleep, sit, or rest from one day, week, or month to the next. And this takes a toll. It took a toll on my own family between April 1995 and March 1998, especially the first seven months after the 616 fire. I’m convinced it’s why my younger siblings struggled for years afterward to earn a high school diploma or GED. The disruption in their lives, of their dreams, in their peace of mind. It can and does drive many people to drink, drugs, and madness. It drives those who are with mental illness to the grave, like my former classmate Brandie Weston. Yet our nation homeless-proofs itself with jagged spikes on stone walls, covered steam grates, and patrol officers hell-bent on making sure homeless Americans will not see one moment of sleep and rest. We treat our most vulnerable Americans as if they’re some form of contagion, a diseased sort of garbage that we’d love to put on a barge and dump in the middle of the Pacific. America in our policies and our people visits indignities, malignancies, and wrath upon our homeless, whether military veterans, impoverished families, or mentally ill individuals. It’s what we do to anyone in our nation who isn’t a so-called winner. And if you’re a person of color who’s homeless, the best you can hope for is being near a college campus, where a steady stream of the well-off exploit your stories for A’s and writing jobs. America does “to the least of us” whatever it can to take advantage, ridicule, hide, and even eliminate their existence. Proving once again that while America is a great nation, we are a horrible people. Phil Collins was right. We “can tell from the lines on her face” that America has forever calloused itself, human but often devoid of humanity. Excerpt from Frank Deford, “Cheer, Cheer, Cheer For The Home Team,” Sports Illustrated, August 13, 1984, p. 38. (http://www.si.com/vault/1984/08/13/620469/cheer-cheer-cheer-for-the-home-team). 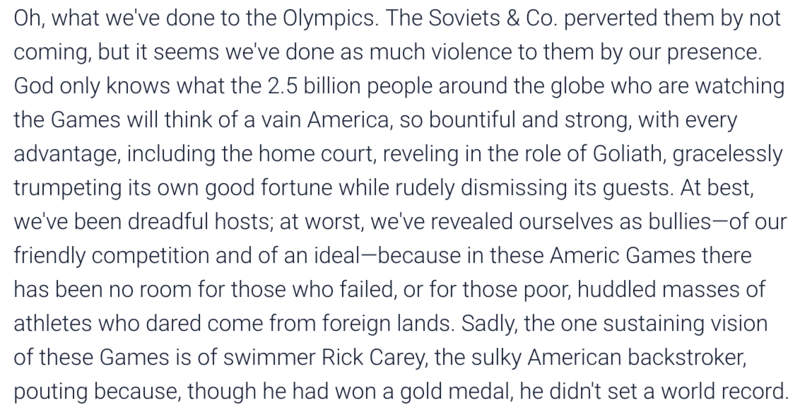 The famous and often loopy sports writer Frank Deford wrote this about America’s narcissistic display of celebration in the 1984 Summer Olympics in Los Angeles. Despite the changes in location, the change in networks, and the shifts in coverage over the years, the ability of the US to celebrate its greatness as if the nation was an underdog every four years knows no bounds. Americans moralize, spin stories of wholesome athletes, and frame the games as if the rest of the world is a bunch of losers. Chuck a few words like “The Soviets,” “2.5 billion,” and “Rick Carey,” and substitute “The Chinese,” “5 billion,” and “Lilly King” or “Michael Phelps.” That, and the locale being Rio de Janeiro, are the main differences. 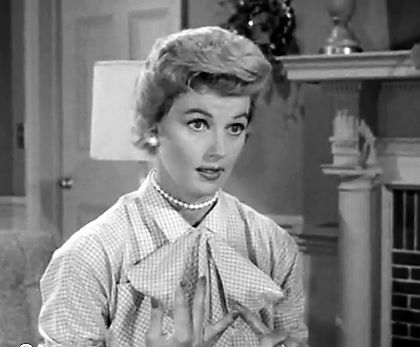 The late Barbara Billingsley as June Cleaver in Leave It To Beaver, October 17, 2010. (http://www.digitaljournal.com/article/299042). NBC’s coverage has been narcissistic jingoism to the extreme. If you want to see Olympians from other countries who competed but didn’t win gold — or Olympians who won gold but don’t speak English — you can pretty much forget about seeing them on NBC. BBC News has provided more of this global coverage, even in the midst of its British/British Commonwealth bias. NBC can say that it’s giving Americans what they want. Really? Primetime coverage on the mothership and spotty and often tape-delayed coverage on its other channels, with a few clips online? Wow, Americans must only care about America so much that they are willing to miss hours of inspirational stories and exemplary athletic performances. Yet apparently Americans do want the dozens of mentions of Maya DiRado’s recent marriage and new house in Atlanta, where she’ll apparently settle down like June Cleaver after The Games. That, and that most Americans expect to win, like the way L.A. Lakers fans have been at home games assuming twenty-point blowouts night after night for the better part of 60 years. This isn’t to say that Americans haven’t achieved greatness during the Rio Games. Michael Phelps, Katie Ledecky, Lilly King, Maya DiRado, Simone Biles, Simone Manuel, Laurie Hernandez, Michelle Carter, Ibtihaj Muhammad, Aly Raisman, Gabby Douglas, Corey Cogdell-Unrein, Allyson Felix, among so many others, have had great, even historic, times. Yet Americans celebrated Ledecky’s 11-second win in the 800m final as if it was preordained magic and proof of American imperial superiority at the same time. Swimming is a resources-dependent sport, requiring Olympic-sized pools, investments in coaching, and thousands of hours of training. That Ledecky won by such a huge margin isn’t just an indication of superior athletic talent and training. It’s a reflection of a serious financial commitment by parents and public/private funds from the richest nation in the world to making gold medals in swimming a priority. It’s an example of haves versus have-nots, an unfairness baked into the cake of the Social Darwinist modern Olympics from the time they began in 1896. Rich vs. Poor cartoon, John Darkow, September 18, 2011. (http://www.columbiatribune.com). Lilly King and others have moralized about their achievements being done without the enhancements of PEDs. As if American athletes are always clean. As if American Olympians haven’t been caught doping in the recent past. As if the advantages of living in a wealthy nation committed to winning above all else doesn’t translate into maximizing athletic talents in every Olympic sport. King’s bravado might have been seen as cute or wonderful by some, especially over her Russian competitor Yuliya Efimova. But it’s no different from Donald Trump bragging about how much money he has to a room full of ex-cons who served time for shop lifting or stealing a few dollars. There’s a racial component to all of this as well. It’s okay for wholesome folks like Phelps to make Chad Le Clos look stupid, or for King to moralize about doping. Not so much in the Black-dominated track and field, or in men’s basketball, or for Blacks in swimming and gymnastics. There, Americans not only expect their Olympians to win. They expect them to know their place, not discuss race, and have their hand over their heart when the National Anthem’s playing. 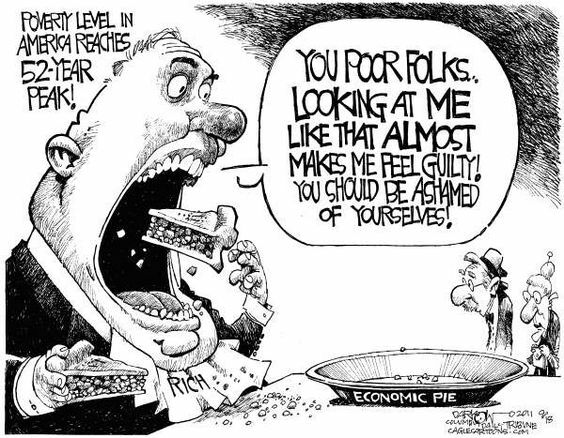 U2 in “Crumbs From Your Table” (2004) asked the question — in regard to rich countries like the US — “Would you deny for others what you demand for yourself?” In the case of the US, the answer is, “U-S-A! U-S-A! U-S-A!,” or “Y-E-S! Y-E-S! Y-E-S!” Americans already do it to each other, through racism, misogyny, homophobia, xenophobia, and plutocracy. Why would it be different for the US regarding the rest of the world?